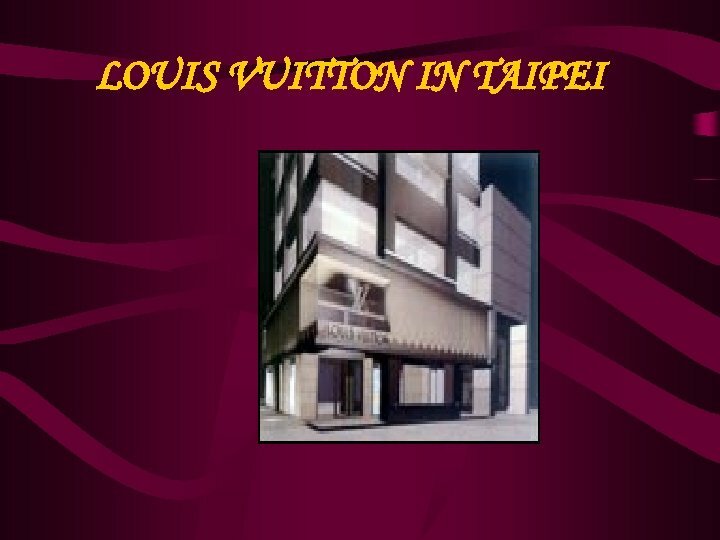 HISTORY Louis Vuitton was born in Anchay in the Jura Mountains in 1821. 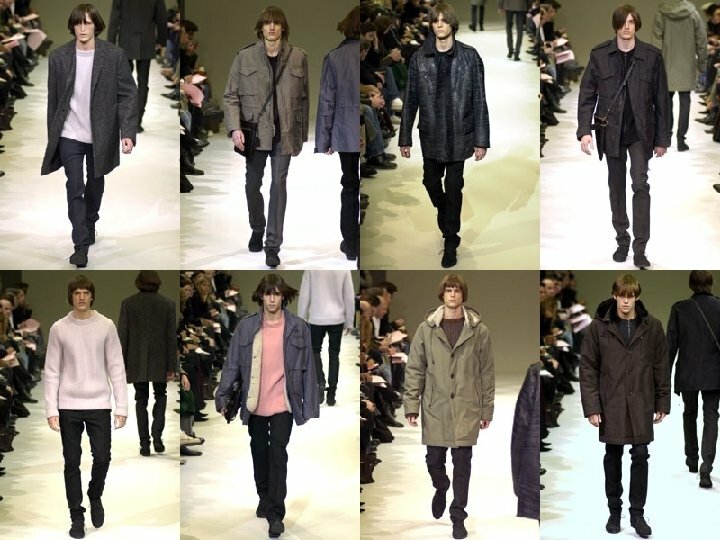 At age fourteen, Louis Vuitton set out for Paris on foot. 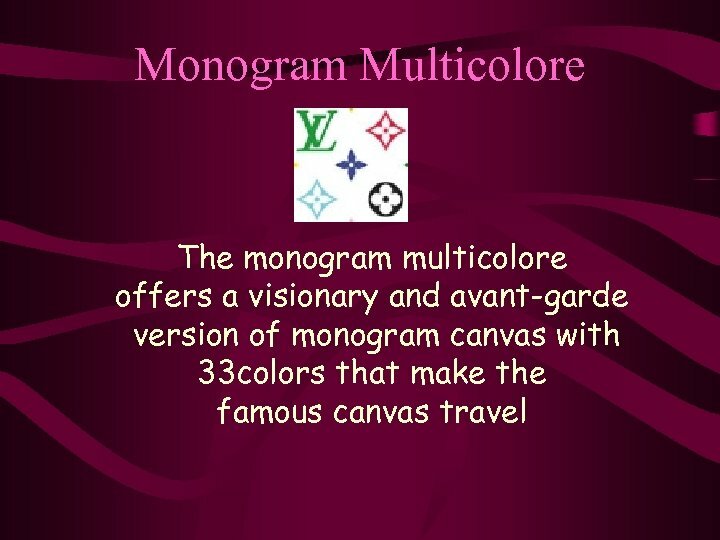 After two years of learning a trade, he arrived in Paris in 1837 where he is apprenticed to a packing-case maker. 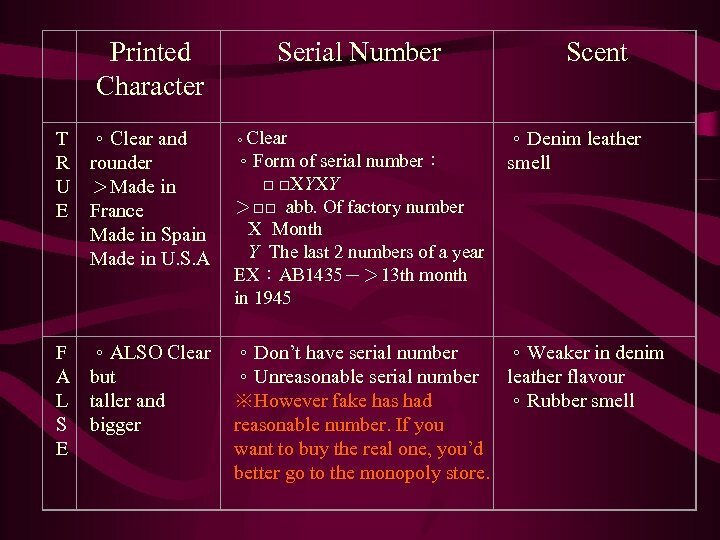 The history of travel has always been linked to this legendary Frenchman. 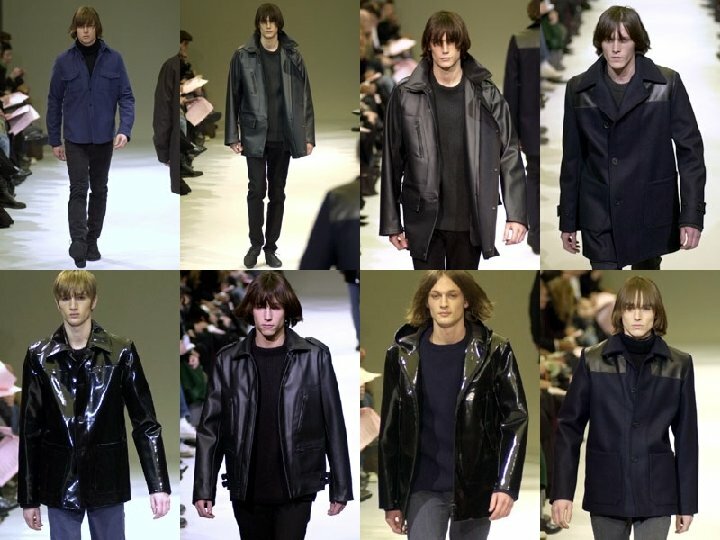 The tradition of Louis Vuitton goes back a long way. 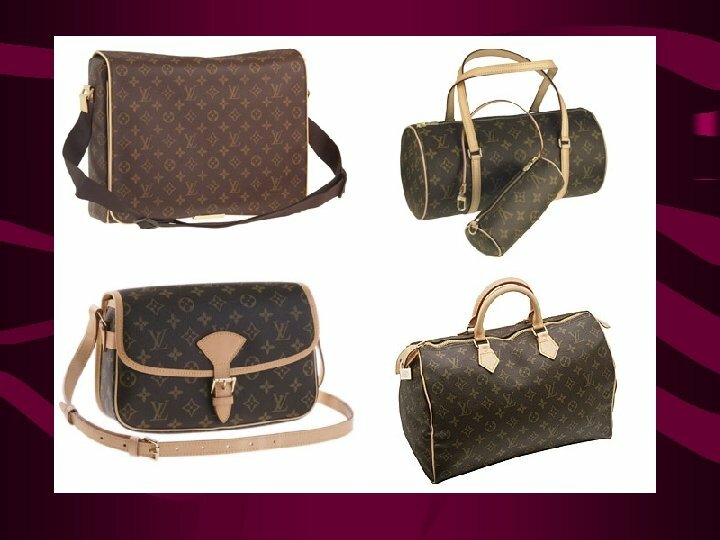 The company was founded in 1854 by luggage manufacturer Louis Vuitton Malletier who set the standards for design by insisting on extraordinary quality and craftmanship in every product. 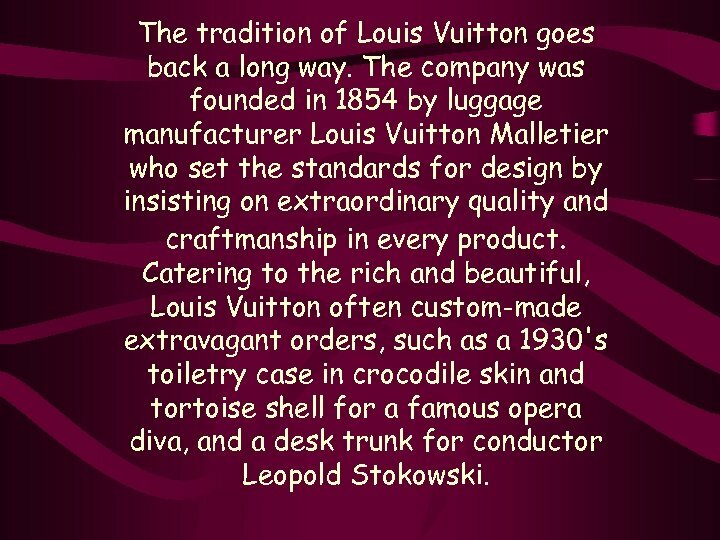 Catering to the rich and beautiful, Louis Vuitton often custom-made extravagant orders, such as a 1930's toiletry case in crocodile skin and tortoise shell for a famous opera diva, and a desk trunk for conductor Leopold Stokowski. 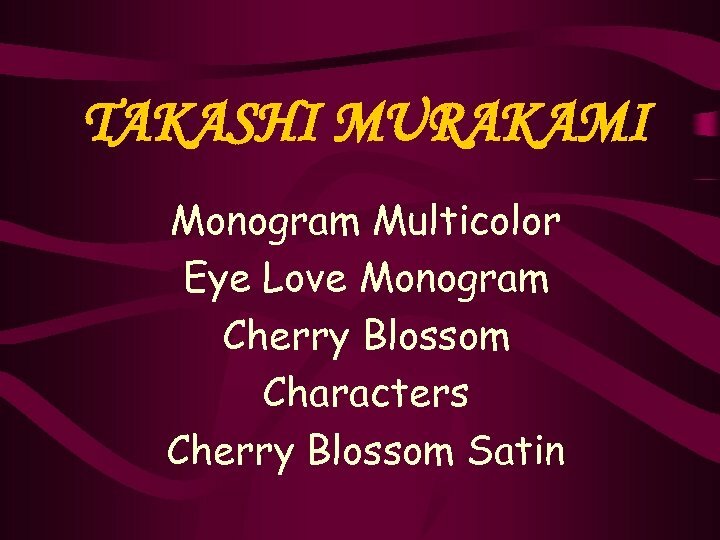 His visionary approach in designing luggage was unrivaled during his days. 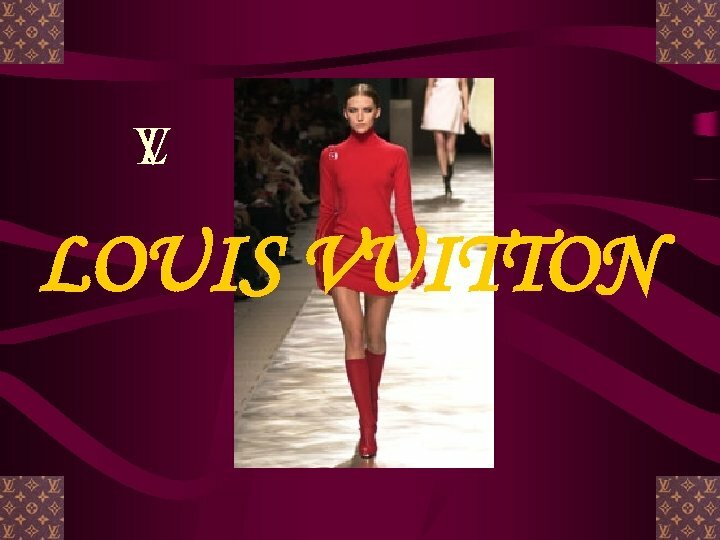 A good example was in 1875, the couturier Charles divulged an important trade secret to Louis Vuitton: crinolines and leg-of-mutton sleeves would soon give way to softer materials. 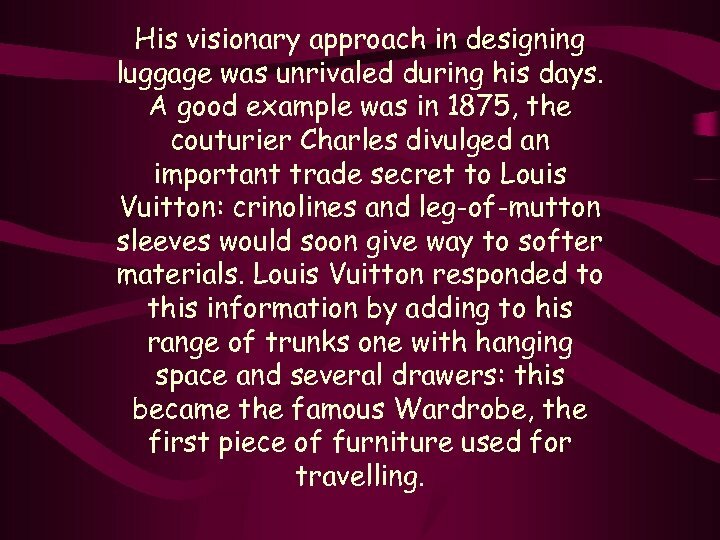 Louis Vuitton responded to this information by adding to his range of trunks one with hanging space and several drawers: this became the famous Wardrobe, the first piece of furniture used for travelling. 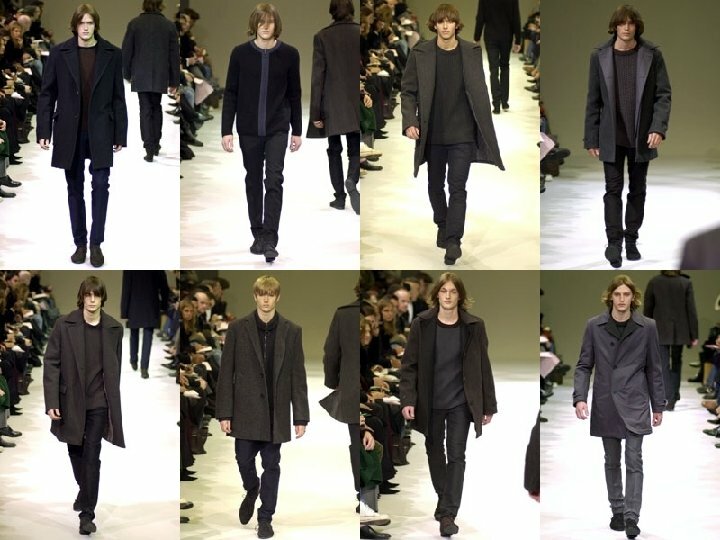 In recent years Louis Vuitton has dusted off its slightly stuffy image. 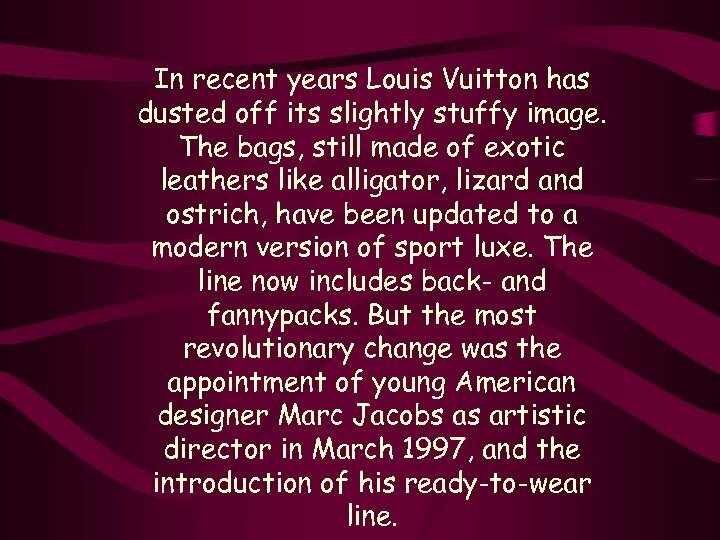 The bags, still made of exotic leathers like alligator, lizard and ostrich, have been updated to a modern version of sport luxe. 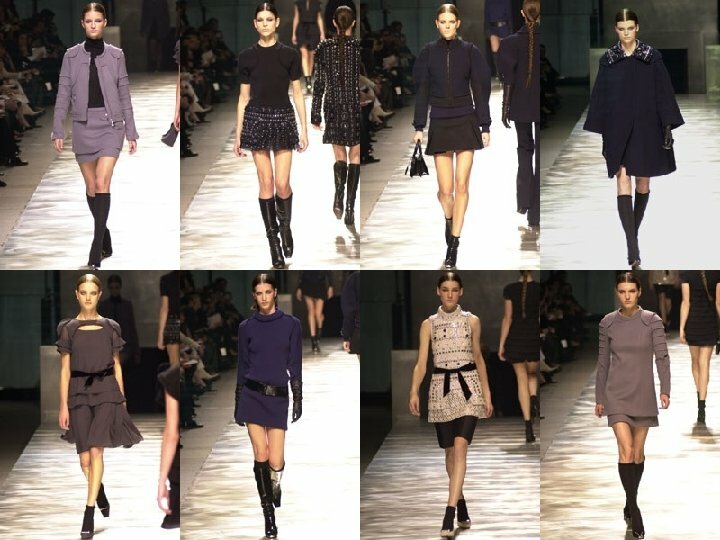 The line now includes back- and fannypacks. 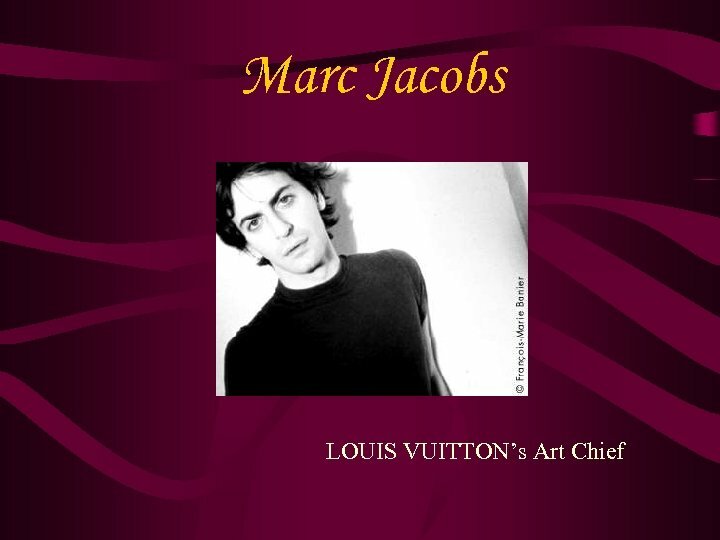 But the most revolutionary change was the appointment of young American designer Marc Jacobs as artistic director in March 1997, and the introduction of his ready-to-wear line. 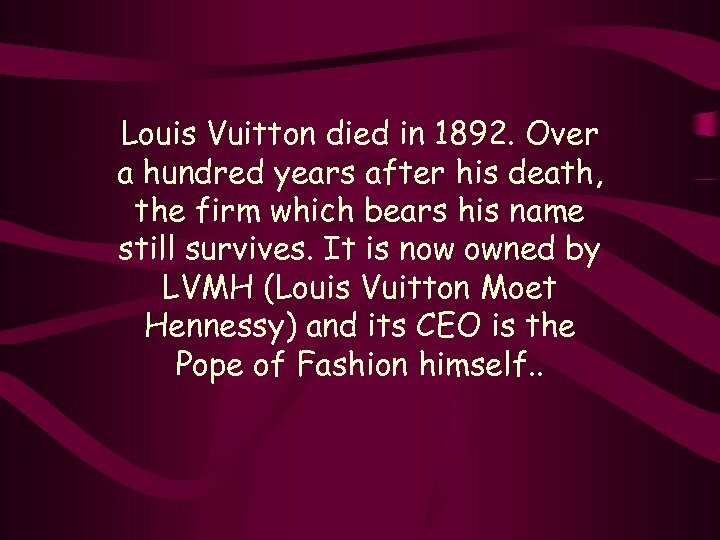 Louis Vuitton died in 1892. 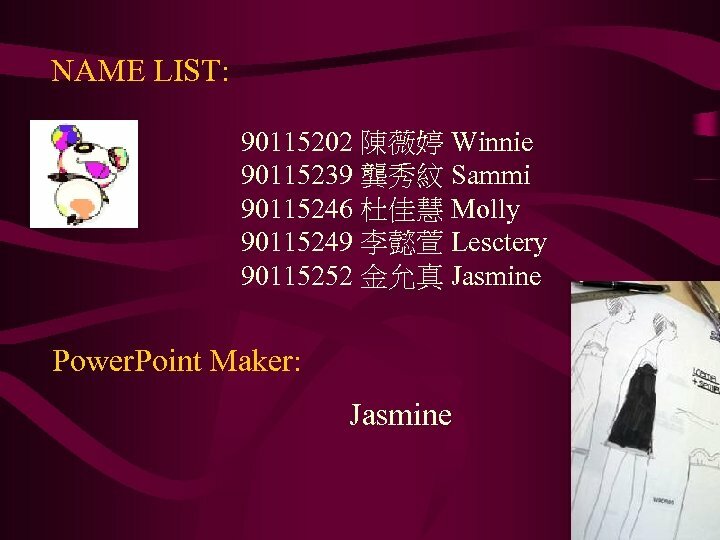 Over a hundred years after his death, the firm which bears his name still survives. 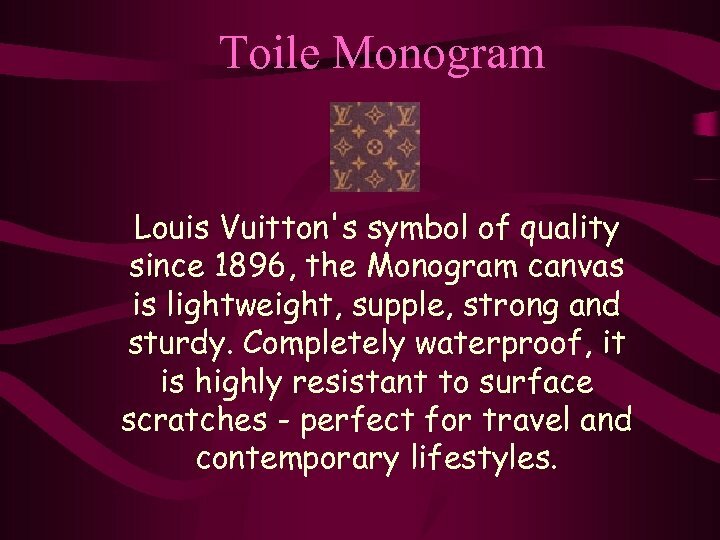 It is now owned by LVMH (Louis Vuitton Moet Hennessy) and its CEO is the Pope of Fashion himself. .
Toile Monogram Louis Vuitton's symbol of quality since 1896, the Monogram canvas is lightweight, supple, strong and sturdy. 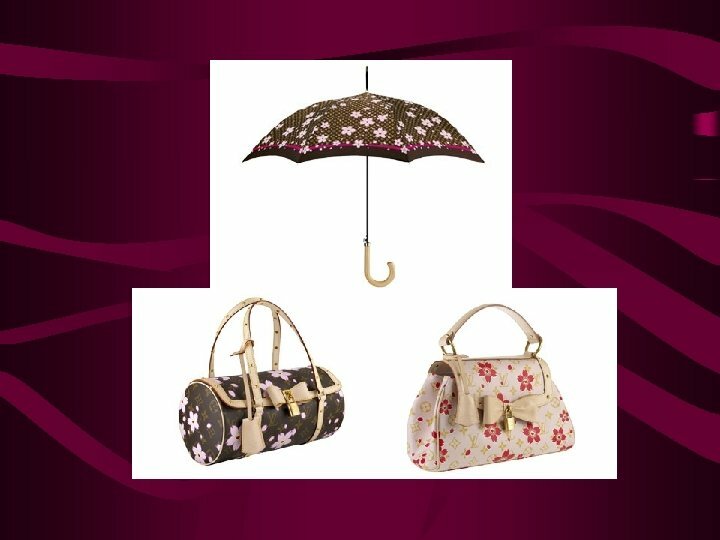 Completely waterproof, it is highly resistant to surface scratches - perfect for travel and contemporary lifestyles. 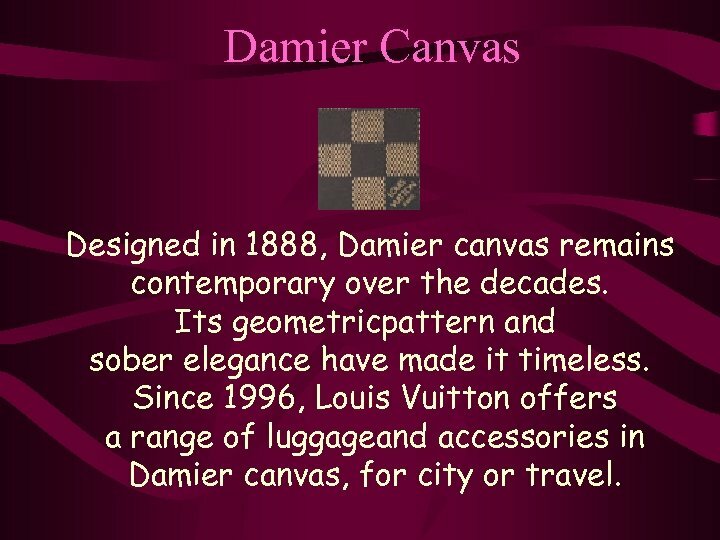 Damier Canvas Designed in 1888, Damier canvas remains contemporary over the decades. 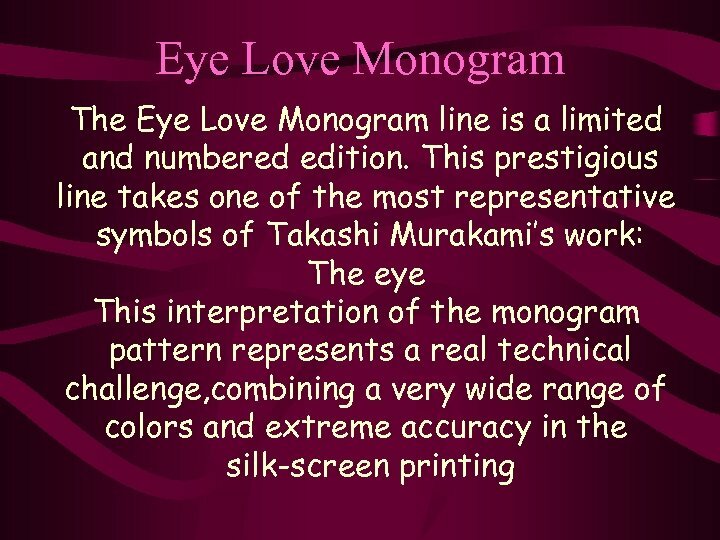 Its geometricpattern and sober elegance have made it timeless. 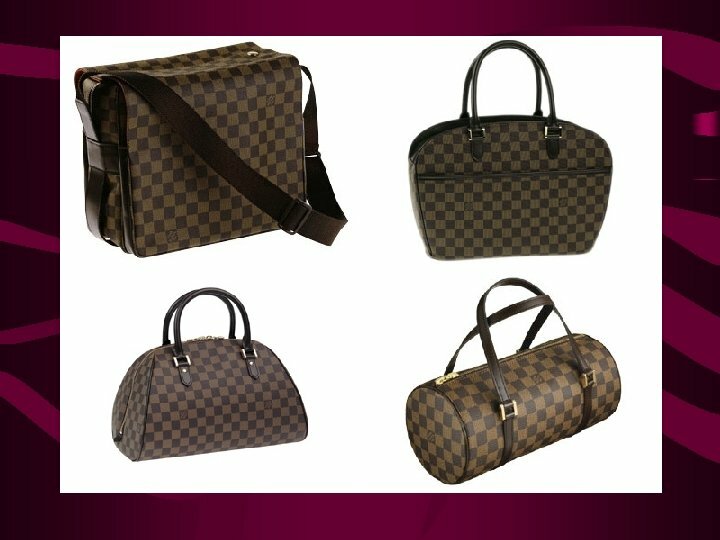 Since 1996, Louis Vuitton offers a range of luggageand accessories in Damier canvas, for city or travel. 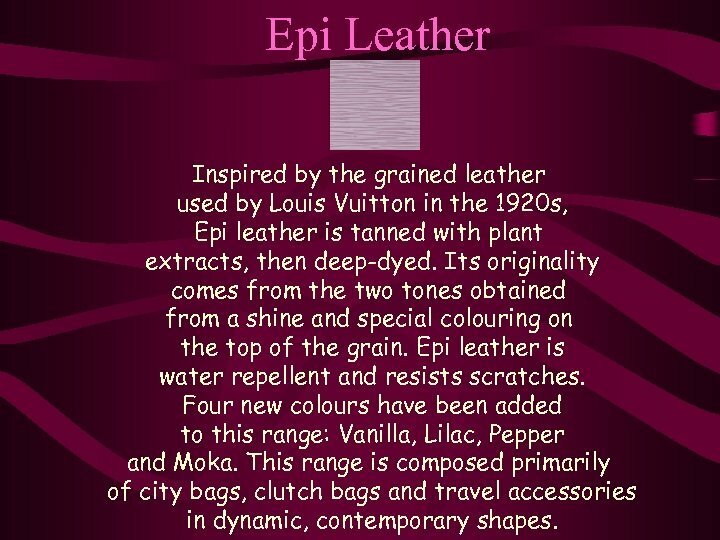 Epi Leather Inspired by the grained leather used by Louis Vuitton in the 1920 s, Epi leather is tanned with plant extracts, then deep-dyed. 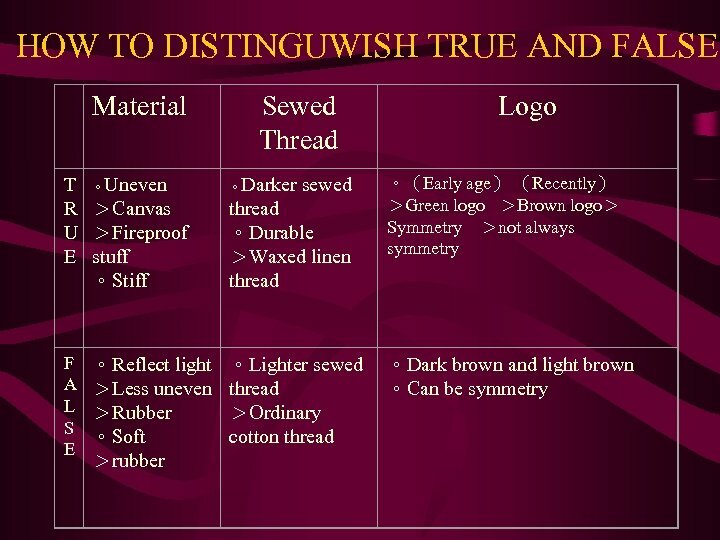 Its originality comes from the two tones obtained from a shine and special colouring on the top of the grain. 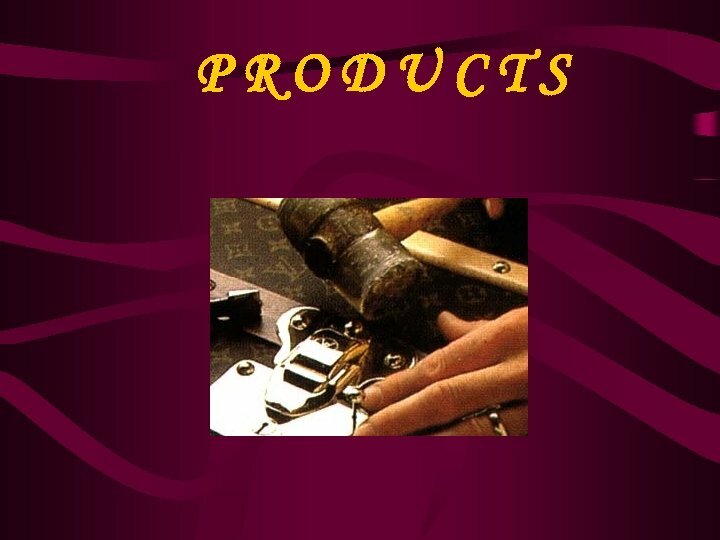 Epi leather is water repellent and resists scratches. 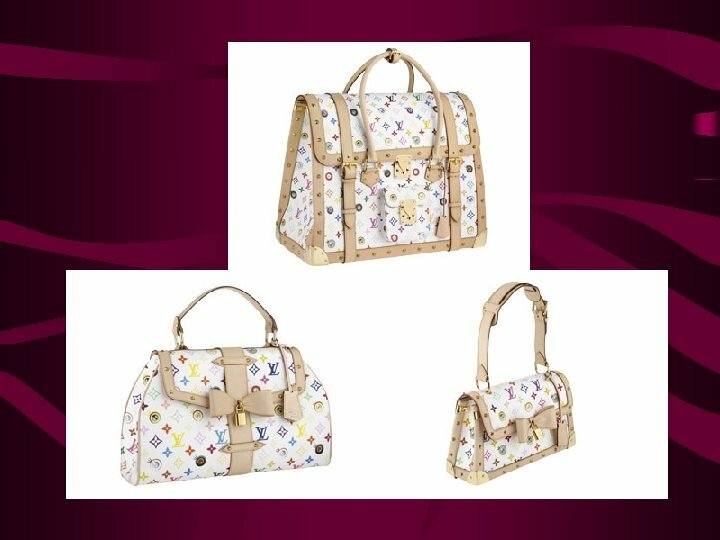 Four new colours have been added to this range: Vanilla, Lilac, Pepper and Moka. 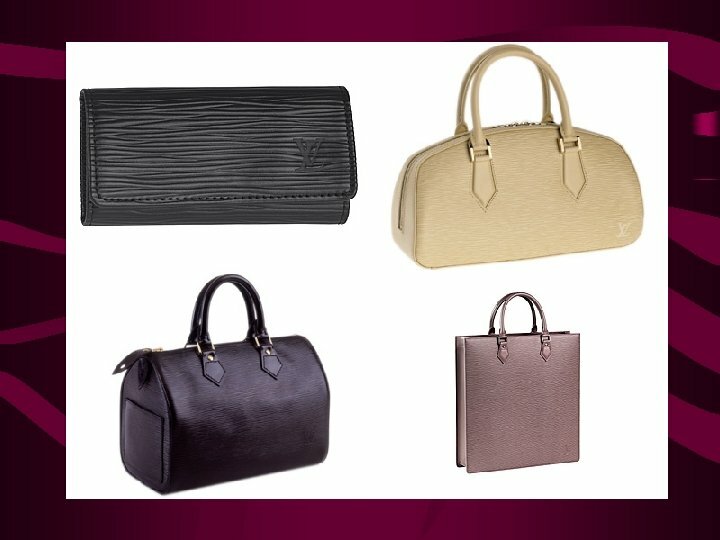 This range is composed primarily of city bags, clutch bags and travel accessories in dynamic, contemporary shapes. 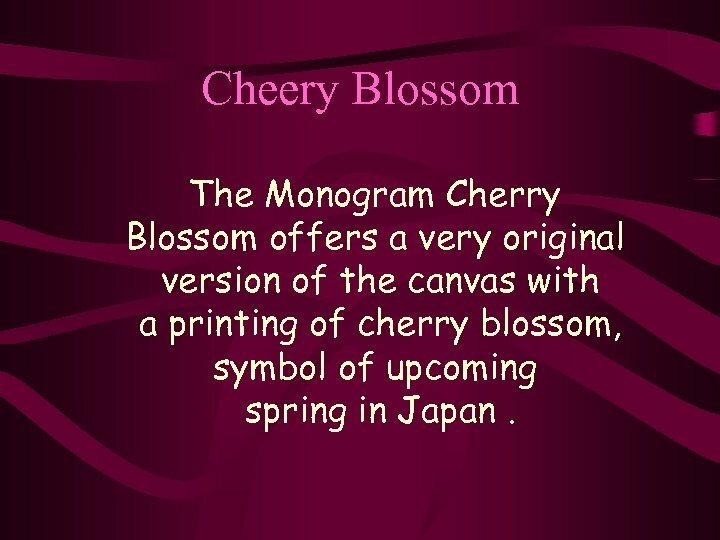 Cheery Blossom The Monogram Cherry Blossom offers a very original version of the canvas with a printing of cherry blossom, symbol of upcoming spring in Japan. 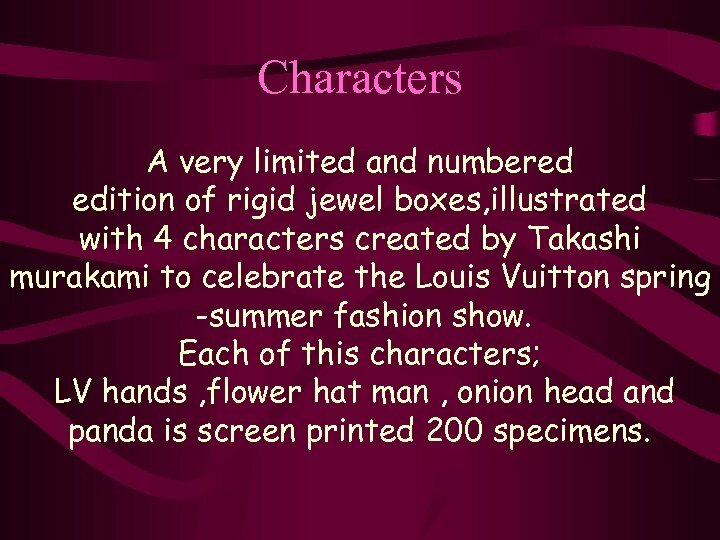 Characters A very limited and numbered edition of rigid jewel boxes, illustrated with 4 characters created by Takashi murakami to celebrate the Louis Vuitton spring -summer fashion show. 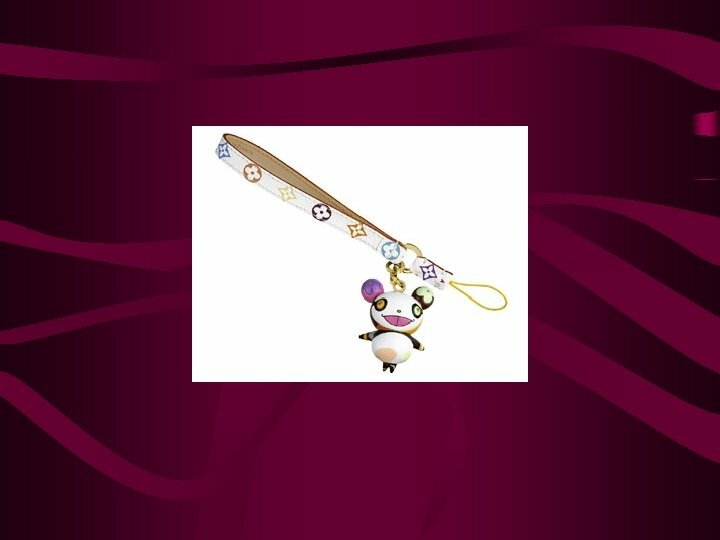 Each of this characters; LV hands , flower hat man , onion head and panda is screen printed 200 specimens. 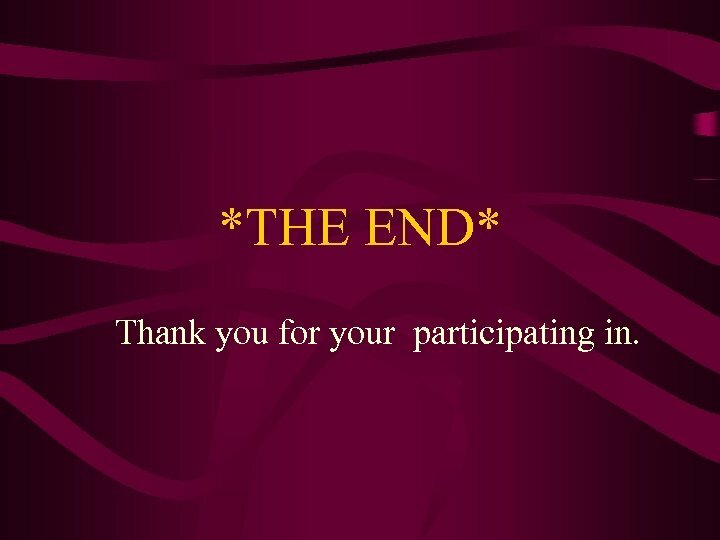 *THE END* Thank you for your participating in.